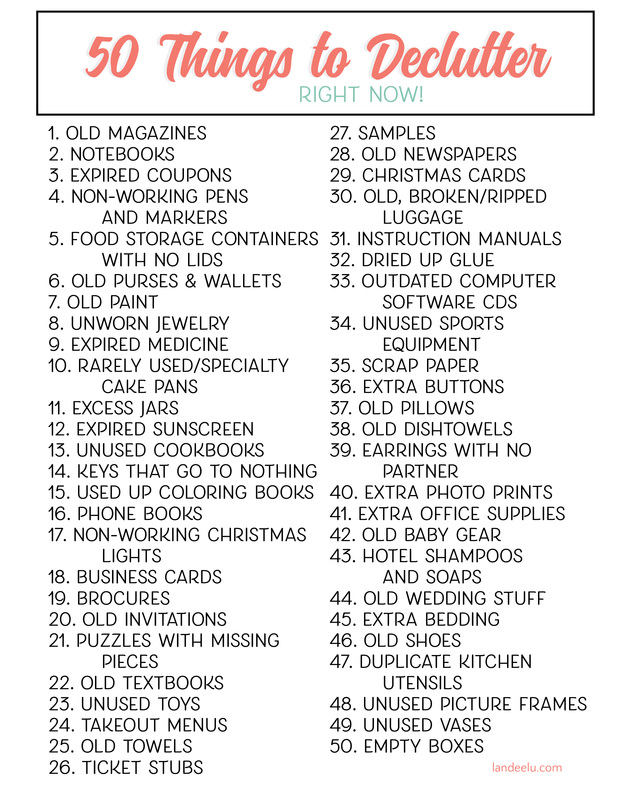 You are here: Home / Organization / Declutter Your Life: 50 Things to Get Rid of TODAY! Declutter your life and start to breath again! Open space. Room to think. Freedom. It’s within your reach. Did you know that the average American home has over 300,000 items in it? The size of the average American home has TRIPLED in the last 50 years yet 25% of us can’t even park our cars in our garages because they are chock full of STUFF. We are suffocating under our things and the debt we have incurred obtaining them. If you’re ready for a change but don’t know where to start, this list of 50 items you can declutter today is just what you’ve been looking for! Don’t feel guilty. Don’t regret your past purchases. Give open space in your home the proper value that it deserves and make more of it. The best part? It’s free. No purchase necessary. Learn from your mistakes and move forward with your life. Here are 50 items you can discard TODAY! When possible try to recycle responsibly, donate or re-home your things HOWEVER, some things just need to be thrown away and that’s ok too. Are you ready?? Let’s do this! The easiest way to organize your stuff is to get rid of most of it. OLD MAGAZINES– I know you think you’re going to go back through that HGTV magazine from April of 2014 but, if you’re honest with yourself, you know you won’t. Going forward, if you see an idea or article you’d like to keep, go ahead and rip it out and put it in a file or 3 ring binder where you keep all of your “special ideas and inspo” for future reference. NOTEBOOKS– How many half used or barely used notebooks do we all have laying around our homes? Too many! Recycle or rip out the few pages you actually did use and donate. EXPIRED COUPONS– Why do we hang on to these? Most establishments do not accept expired coupons (Bed, Bath & Beyond will, however), so declutter them and free up some space! DRIED OUT/NON-WORKING PENS AND MARKERS– We all have that drawer or bucket that collects pens, pencils, markers, colored pencils, etc. Take 20 minutes or so and test them out and pitch the ones that no longer work. I can’t tell you how many times I’ve needed something to write with, I grab a pen, it doesn’t work and I just PUT IT BACK IN THE BUCKET…. why?? After your initial sort be sure to pitch those pens and markers the second they stop working. Better yet? Have 10 pens in your whole house that always work and you always know where they are (this is not impossible!). FOOD STORAGE CONTAINERS WITH NO MATCHING LIDS– The reality is that we really don’t even realize it when a food storage container loses it’s lid. It just happens. Take a few minutes to sort through your containers and make sure each one has an air tight lid to go with it… otherwise, what’s the point? Get rid of any that no longer function as they are supposed to (missing or warped lids, cracked, etc) so you always have perfect containers to store those delicious leftovers in. OLD PURSES & WALLETS– You know darn well that the second you get a new purse or switch over to a new wallet that there is NO WAY you’d ever go back to your old one. Declutter and donate them and move on with your life. OLD PAINT– This needs to be done in a responsible way but do it, you must (#Yoda). My local paint store here in town will accept up to 5 gallons of paint each day to be recycled. You probably have some paint cans that you need to keep around for touch ups but I can almost GUARANTEE that you also have some cans filled with paint that have long since been painted over in your home. Recycle and free up some serious shelf space out in the garage! Yay! UNWORN JEWELRY– I’m the kind of girl who pretty much just wears hoop earrings and a wedding ring every day. Occasionally I might throw on a necklace for church or date night as well. Be honest with yourself and your style and see what jewelry you can donate. My guess is you can get rid of A LOT. EXPIRED MEDICINE– Medicine loses its effectiveness overtime. If it’s been expired for a few months, it’s your call. A few years? Buh-bye. RARELY USED/SPECIALTY CAKE PANS– Yes your son wanted that lego birthday cake when he was four… but now that he’s 15? Maybe not so much. Declutter and pass on those cake pans and free up some kitchen cupboard space! EXCESS JARS– Mason jars, empty jelly jars, jars for crafts… they seem to multiply in the cabinets while we sleep. Evaluate why you have so many, how many do you REALLY need and get rid of the rest. EXPIRED SUNSCREEN– It really does expire! And sunscreen is not one of those things you want to slather all over yourself and your kids only to find out it no longer works like it should. Ouch! Buy new each year and keep yourself properly protected. Oh, and get rid of the old bottles and cans, of course. UNUSED COOKBOOKS– The internet has made cookbooks more and more obsolete. I bet you can find any recipe you can dream up on the internet somewhere! Keep your most loved and most used cookbooks and ditch (donate) the rest. KEYS THAT GO TO NOTHING– I had a little jar of keys that went to nothing for about 10 years. WHY? And when I found a new one somewhere in the house I’d try it on all the doors. If it didn’t work I’d put it in the jar. Don’t be like me. Get rid of keys that open nothing. I was so happy when I finally got rid of that little jar! USED UP COLORING BOOKS– Congrats on keeping one until it was actually completed! Now say good bye. There is no reason to keep it… it has fulfilled its purpose. Declutter, declutter, declutter. PHONEBOOKS– How are phonebooks still legal to produce and distribute? It’s an incredible waste of resources since everything is online/on your phone, if you ask me. Request to not receive one or recycle it ASAP. NON-WORKING CHRISTMAS LIGHTS– When you put up your Christmas decor, and again when you take it down, take a good inventory of your lights. If bulbs need replacing, do it. If entire strands don’t work, it’s time to let go. Your next Christmas self will be so happy. BUSINESS CARDS– Put the pertinent info in your contacts (if desired) and declutter the actual card. In this digital day and age there’s no reason to have a bunch of business cards floating around. BROCHURES– If there’s a company you’re interested in, look at their website. There will be way more information there than they can fit onto a brochure anyway… and bonus, no clutter for you! OLD INVITATIONS– It’s tempting to keep wedding invitations with the darling couple’s photo on it, I know, but it’s not really your responsibility to archive such things for them. Keep the invitation until the day of the event and then dispose of it properly. PUZZLES WITH MISSING PIECES– Is there anything more satisfying than pushing the final piece of a puzzle into place? No. Is there anything more frustrating than spending hours on a puzzle only to find out it’s missing pieces??? No. Do yourself a favor (and free up space!) and declutter those puzzles tout suite! OLD TEXTBOOKS– They might have some nostalgia attached to them from your college days but old textbooks are pretty much worthless. Outdated information. Bulky. Hard to find what you’re looking for in them anyway. The internet is your friend here. No need to keep a 10 lb. book anymore! UNUSED TOYS– This is best done when your child is not around. They may not have played with an object for months but as soon as they see you attempting to get rid of it they will try and convince you that you are getting rid of their BEST FRIEND! You know they no longer play with it. Donate it during nap time. Your child will have more room to play with the things they actually enjoy. TAKEOUT MENUS– Again, restaurants post their menus online! Huzzah! No need to keep these little buggers. Declutter them and free up space in your kitchen drawer. OLD TOWELS– Should you keep a few old towels? I would say yes. But how many do you REALLY NEED. I mean, really. The problem is we buy new towels but the old ones are still “perfectly good” so we don’t ever get rid of them. Repeat this process a few times and you will end up with so many “old towels” you won’t have room for anything else! Go through and keep a few old towels for washing the car, the dog, cleaning up spills, etc. and donate the rest. You’ll be so happy with all of the space in your linen closet. TICKET STUBS– This one might be a tad controversial as some people like to keep ticket stubs as a way of memory keeping. Yes, a ticket stub can jog your memory of the event, but the memory is actually in YOU, not the ticket stub. Chances are you took a photo or two at the event which can bring up the memories just as easily. More than the physical clutter, trying to keep track of ticket stubs can cause some mental clutter…. where should I store them? And how? I need to remember to keep this stub to put it with my collection. Where are all of my other ticket stubs? And so on and so forth. Just do yourself a favor and don’t keep them to begin with. SAMPLES– Use them immediately or get rid of them. A half used packet of a hair mask in the shower can only be tolerated for so long. OLD NEWSPAPERS– If you even still receive the newspaper rather than reading it online, don’t keep more than a few days worth of issues. The news moves fast and they become outdated in a very short time period. CHRISTMAS CARDS– I literally used to keep every single Christmas card I received each year. I’d label a gallon size ziplock baggie with the year and put them all inside. At some point I had an entire bin filled with these baggies. AN ENTIRE BIN. In a moment of clarity I realized the insanity and tossed them all. Am I the world’s archivist? No. Again, don’t be like me on this one. Enjoy your Christmas cards you receive, display them even. They served their purpose to spread Christmas cheer and warm wishes. Now let them go. OLD, BROKEN/RIPPED LUGGAGE– First of all, if you use broken or ripped luggage on a trip you will, at the very least, be super annoyed or at worst, lose something you value/need! Broken zippers, busted wheels, bent handles… these are the last things you want to be dealing with while traveling. Do yourself a favor and dispose of your crappy luggage (or fix it if you have the means) so you won’t accidentally use it for your next trip! Usually we get a new piece of luggage but keep the old. If you get a new suitcase, donate or throw away the old one (if broken beyond repair). It happens. Don’t feel guilty. INSTRUCTION MANUALS– There are less than zero reasons to keep an owner’s/instruction manual. EVERYTHING is online! In the off chance that you’ll need it after your initial set up you can go online and get all of the information you need. If you still have an issue you can call customer service of the product. What you don’t need to do is have a shelf or file dedicated to owner’s manuals. That is a complete waste of space. Recycle those bad boys out of your life! DRIED UP GLUE– Why do we keep these kinds of things? I have no idea, but we do. If glue is unusable now, it will be unusable in a week or a month. Declutter it. OUTDATED COMPUTER SOFTWARE CDs– I think I found a Photoshop Elements 4 disc in my drawer a while ago. That’s about 9 versions back. Old Microsoft Word discs? CD-ROM games your kids used to play? My computer doesn’t even have a disc drive anymore, does yours? Regardless, you have permission to declutter those. Outdated, unnecessary, clutter. UNUSED SPORTS EQUIPMENT– You might be like me and have these moments of “we are now going to be a tennis playing family!” so you go out and get everyone a racket. Then you go play once. Everyone is terrible. You never play again… but you now have those dang rackets. It’s a total bummer but who knows? You all could have loved it and that would have been great! But since you didn’t it’s now time to unload those rackets to someone else who will… either sell or donate them ASAP. There’s no point in hanging onto them as a reminder of a bad purchase. SCRAP PAPER– It SEEMS like a good idea to keep paper that was only used on one side, doesn’t it? I mean, what a waste to throw it away when the back could be used for notes, doodling or anything else! I totally agree. But I think the key here is to limit yourself on how much scrap paper you keep around, if you choose to do so. This is something that can get completely OUT OF CONTROL. Give yourself a space limit for scrap paper… maybe you have a desk drawer you can dedicate to it or a small bin on a shelf. Then, once it’s full, you need to start throwing paper in the recycle bin. EXTRA BUTTONS– I’ve made over 40 trips around the sun and I have never, not even one time, used an extra button that came with an article of clothing as a repair for said article of clothing. Usually by the time the button is coming off I am ready to donate it anyway or I have simply re-sewn that button back on. Ditch the extra buttons! OLD PILLOWS– I read somewhere about the nasty things that get trapped in pillows… dirt, oil, dead skin cells and dust mites, to name a few. Please, please wash your pillows! But, if you ever decide to get new pillows, go ahead and let the old ones go. They don’t do any good sitting in a linen closet from now to eternity. Keep a couple for guests and that’s it. They take up so. much. room. Declutter your pillows and it will make a huge difference! OLD DISH TOWELS– “Old dish towels work just as well as new ones!” you might be saying to yourself. I agree 100%. But you don’t need an entire drawer full of old dish towels. Again, be honest with yourself as to how many you really need. Like, really. And donate or toss the rest. EARRINGS THAT HAVE NO PARTNER– This seems reasonable but for whatever reason we hang on to that lone earring in hopes that the other one will turn up. It probably won’t. Go ahead and just get rid of that lonely earring. It’s fine. EXTRA PHOTO PRINTS– Back in the day when getting prints from negatives was the only option having double prints of your photos almost made sense. But now? No way! Even single prints of photos might not even be necessary! Back up your digital photos online and then post them where you want to but you no longer need to have physical copies of photos. It’s a wonderful time to be alive, people! EXTRA OFFICE SUPPLIES– Going back to “how many do I REALLY need?” comes in very handy when office supplies are on the table. You only have two hands, after all. Do you need 4 staplers? 100s of pens? 6 pairs of scissors? Keep your best ones and dispose of the rest. And bonus, you’ll most likely always know where they are! OLD BABY GEAR– Moving on from the baby stage can be hard for some reason. Maybe you aren’t sure if you’re done having babies! At some point you ARE done and at that point I would encourage you to pass along your baby gear to someone who might need it more than your storage room does. Take a moment to be sad that your babies are growing up, be grateful they are developing normally, and embrace their new phases. But most of all, get rid of the crib and high chair! HOTEL SHAMPOOS AND SOAPS– Keep one in your travel bag and ditch the rest. Avoid the temptation to have a drawer full of them “just because they’re free.” They are taking up space in your home, and that’s not exactly free, now is it? OLD WEDDING PARAPHERNALIA– If you’ve been married for any amount of time you’ve probably come to the realization that a marriage is very different from a wedding. All of the wedding trinkets have nothing to do with your actual marriage. You have your ring, your wedding dress has been well documented in photos, I’m guessing, as well as the flowers and everything else. No need to have favors, embossed napkins and the like taking up space in your home too. EXTRA BEDDING– Take a moment and be realistic about the number of extra blankets and sheet sets you need for your home. At maximum you need one sheet set for each bed and one extra. But in reality? You really only need one sheet set per bed. I wash, dry and put back on my sheets all in one day. That saves me from having to fold and store them! Plus then they feel and smell so fresh that night! Why would I want to pull a set out of a dark airless cupboard? Keep your favorite sheets and donate the rest. It’ll be fun. OLD SHOES– This is another case where we get a new pair but never discard the old. Maybe we keep around the old tennis shoes to do yard work. Then a second pair of tennis shoes to wear hiking. Pretty soon you’ve got new shoes, old shoes, older shoes and disgusting shoes. Keep on top of your shoe collection and be vigilant about getting rid of unworn, out of style and uncomfortable shoes that you know you’ll never wear again. DUPLICATE KITCHEN UTENSILS– I recently cleaned out my kitchen utensils drawer in my kitchen and I had 7 whisks. SEVEN! And one was gigantic and I had never used it! I now have two whisks… one smallish, and one biggish. I haven’t missed the other five but I have loved a drawer with open space that I can see everything in it at a glance. Take a look at your kitchen utensils and see how many duplicates you have. I bet you could get rid of quite a few! UNUSED PICTURE FRAMES– I am as guilty of hoarding picture frames as anyone. We always think we need more, more, more. WHY? Create your gallery wall, put up the photos you want along your piano or sofa table and get rid of the rest! You won’t use them so clear out some space for yourself. UNUSED VASES– Keep one in case someone gives you flowers, if you must (although I’m sure you have a mason jar hanging around you could use- see #11) but don’t bother with keeping every last bud vase that you’ve ever come across. Get creative with containers you already have and enjoy the space! EMPTY BOXES– I used to keep every iPhone box every time I upgraded my phone. Those white Apple product boxes are hard to discard! My husband liked to keep boxes electronics came in “in case we moved.” Well, guess what. We did move and we didn’t even end up putting the electronics back in their boxes. We stored the empty boxes for nothing! Recycle what you can and declutter the rest. Open space awaits you! Are you feeling pumped? Can you see the future you unburdened by the things? Start with these “easy” things and build up your declutter muscles. I think you’ll find that the more you declutter, the easier it becomes. The faster you can see the benefits of having less, the more motivated you will be to continue. Please let me know if you have any questions and good luck in all of your decluttering efforts! IT’S WORTH IT. CLICK HERE to read my post on how I changed my mindset on ALL THE STUFF to make decluttering even easier! You can also sign up for my Clear the Clutter & Breathe Email Series! It’s totally free and I share lots of insight into decluttering, our possessions and how to keep them from owning you! I don’t know if I can ever get rid of all the blankets I have. I love them. Love to think about them. Love knowing they’re there. Sigh. I will probably be able to get rid of all the other stuff on your list before I can get rid of my blankets. Also, until I have passed potty-training years for my kids, I will also feel justified in having an extra pair of sheets for those beds. Great article. Got me thinking about how much things I keep that I don’t really need. As a craft soul though, it will be hard for me to get rid of the office materials such as sticky notes, stickers etc. I also have so much empty and half-empty notebooks. I guess it’s time to finally got them in use or give them to someone. If you use the sticky notes and stickers then keep them! This is just a list of things that are usually sitting around, unused and taking up precious space. I just wanted to help people start thinking about easy things to declutter to get going. 🙂 Thanks for your comment! Travel or hotel shampoos can be donated to the local shelters or to local organizations that provide “love bags” to the homeless. Feel good about giving these away, rather then dumping them. Often old towels can be donated to animal shelters. Also, keep in mind that there are organizations who will even come and pick up your old clothes and certain household items from your front porch! This saves time and money, and still helps you help others. Yeah!!!! I love those ideas Lennie! I had heard that about the towels to animal shelters but I hadn’t thought about the hotel shampoos to shelters. Thanks for your comment! This is such a great list. It’s amazing how much stuff we hold onto that we don’t need. I just wish I could convince my kids that they don’t need half of the toys in their room. One more item to add to the list are socks without a mate. I have a pile of socks that have been there forever. The other one is not going to show up by now. Just throw them away, there are two items I refuse to donate and they are socks and underwear. This list is awesome! Thank you for all the ideas and right before Christmas because alot of these things I can donate!